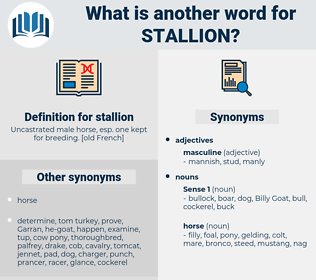 What is another word for stallion? 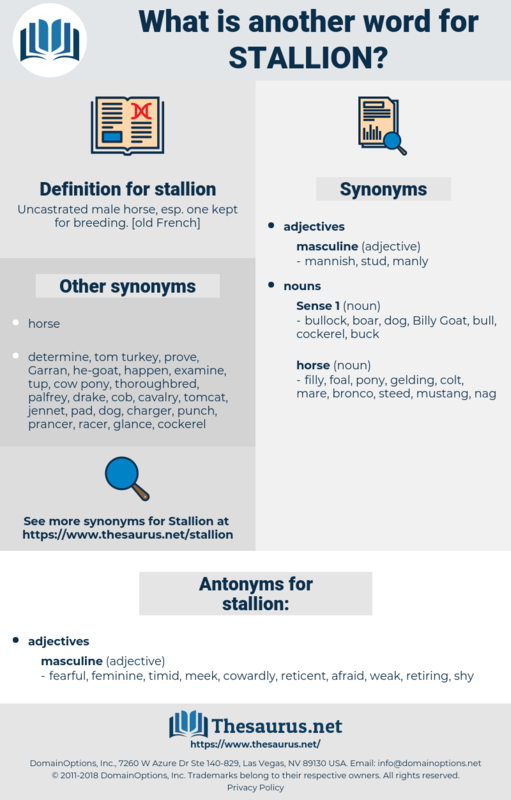 yardstick, Prover, horse, stock, calibration. fearful, feminine, timid, meek, cowardly, reticent, afraid, weak, retiring, shy.
" I will not take the stallion until after we have thrown the dice," cried Modigisel. It was already a trail when the railroad engineer came with transit and chain seeking a path for the great black stallion of steel. soda lime, stately home, stalin, sideline, state line, shoot a line, sweet lemon, settle on, sweet lime, setline, steelman, stolon, stalino, stolen, Sweet William, Sextillion.